Construct a team of experts to effectively manage this valuable resource. Making high-integrity data and records instantly available to caregivers and business decision makers at a low cost is the driving force behind the movement to formally govern such information in healthcare organizations. The emphasis on better data management couldn’t come at a better time. 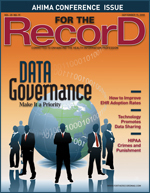 According to “A Data Governance Manifesto: Designing and Deploying Sustainable Data Governance,” a white paper by Jill Dyché, “The average company’s data volumes nearly double every 12 to 18 months.” Faster processing power and cheaper storage media have combined with improved integration technologies to put previously unthinkable volumes of information at the fingertips of thousands of healthcare employees, who are often spread over widely distributed physical environments. For some time, data administrators and data managers have been circulating the phrase data governance around the upper reaches of healthcare organizations. Few in number, these professionals, in conjunction with information services, construct the first large databases that will take data feeds from multiple systems to form data warehouses. These are usually the same people who develop decision support systems to help CEOs and other top management officials strategically direct their organizations down the right path. They are usually analytical individuals acutely aware that a lack of an organizational structure capable of developing and enforcing data standardization often compromises the information that is the life blood of a sound data warehouse. Although most healthcare professionals are hardly aware that a data warehouse exists, its contents are critical in guiding the organization toward financial and clinical success. • Senior business managers with the ultimate authority for acquiring, creating, maintaining, and operating information systems, both manual and automated, within their assigned area of control. • Responsible for improving key results in their “owned” data. • Establish, maintain, and document process and data quality standards and monitor for compliance to such standards. • Support data owners by providing corrective action to processes and/or data found to be noncompliant with quality standards. • Subject matter experts for the particular domain of data under their stewardship. • Technical counterparts to data stewards and technical subject matter experts for technical specifications, definitions, and their implementation in the processing of data. • They are not legal custodians of data or records. Data administrators have also created a portfolio of policies and procedures for governing data, centered around how they should be classified and accessed and the types of quality controls. They have introduced master data management solutions with the hope of instilling an awareness “within both lines of business and IT of how data quality, conflict resolution, access rights, and ownership of data affect the business,” according to best practices recommended by DM Review. In reality, although extensive, precise work went into creating these definitions and hours went into carving out policies and procedures to propel organizations toward good data management, most of this work has remained dormant, waiting for some emergent “fire” to get it underway. Well, the fire is at hand. The cost of not governing data is record high deposits of structured data and unstructured records. Poorly retrievable, unorganized, and unmanaged, these mounds of information impede employee performance and create patient and legal risk when critical data or records cannot be found. Pinpointing the cost of poor data involves finding where the organization lost its way or made wrong decisions based on misinformation that could be traced back to multiple failure points. Although healthcare executives have applied the term governance to managing cash, employees, production plants, technological assets, and multiple other hard assets, they have only recently realized the need to manage information. Now there is a push to create formal governance structures with reporting and decision-making mechanisms to manage these invisible but critical resources, and even the U.S. government is getting into the act. In December 2007, the National Committee on Vital and Health Statistics issued a 62-page document, “Enhanced Protections for Uses of Health Data: A Stewardship Framework for ‘Secondary Uses’ of Electronically Collected and Transmitted Health Data,” that essentially sets the foundation for data governance at a national level. Included are glossaries of acceptable terms, taxonomies, and mechanisms for going about data governance. Efforts to apply data governance from the top down have largely been doomed due to a lack of organizational interest or engagement in an initiative that seemed distant from “real” work, such as installing electronic health records or developing electronic billing systems. Other obstacles to success have included the politics around data governance—who owns what systems and what accountabilities ride along with that ownership. What happens when one area’s definition of a data element varies significantly from another department’s, resulting in a misunderstanding of the data? The struggle to gain consensus-sanctioned data definitions can be surprisingly difficult and may even cause emotional conflicts. Recognizing that previous attempts to establish successful data governance have been unsuccessful, organizations are taking a harder look at the sources of failure. For the most part, previous data governance efforts were started by data administrators or managers, usually without a data governance structure for decision making and conflict resolution. Often these efforts were not tied to any one recognizable organizational strategy but were loosely defined as an effort to gain improved data for better organizational decision making. Although commendable, these efforts often died due to a lack of support from business and IT leaders. Resource allocation has traditionally happened along project lines with return on investment firmly described. The downside to this mentality is that the allocation of resources to build a data governance model has been focused on buying master data management software and consulting services from a vendor guaranteeing a deliverable rather than using a select group of experienced business and IT staff to design and build a data governance structure prior to launching any initiatives. Usually, some “pain points” have developed before an organization can be considered ready to embark on a serious data governance effort. Examples include chronic problems with reporting outcomes of quality improvement efforts, the inability to provide health plan members with accurate, up-to-date benefit information, and the failure to provide the breadth of information that senior management may need to open a new type of healthcare facility. One thing that has worked for some healthcare organizations is identifying the need for data governance through a key project such as implementing a master patient index or constructing an electronic medical record. Every HIM professional already has a stake in managing a reliable master patient index to support not only patient care but also accurate billing and decision support information. The table below demonstrates how data owners, data stewards, and data custodians could be identified during the construction of a master patient/member index for an integrated delivery system. Once a key initiative such as an enterprise master patient index has been identified, it can serve as the foundation of a governance structure. Although organizational readiness to do something seemingly abstract as data governance is not particularly common, executives often quickly grasp the need to adopt it when undertaking a project as important as an enterprise master patient index. However, a data governance project needs more than upper management support. • creating reporting templates and mechanisms to upper management from the data governance body. Figure 1 demonstrates how data owners and stewards can come together with information services to develop a definition of the customer’s (health plan) and patient’s (delivery system) address data element. What the business units are trying to describe to information services is what it needs in the computer system’s field for the “mailing address.” When the two groups collaborate, they create a standardized, agreed-upon definition and ensure that this definition is correctly translated to the information system when it goes into production. This process can be repeated to create a body of standardized data elements. Establishing a change management process ensures that changes to these data elements and the systems that they engage are documented and can create a “data lineage and lifecycle across business processes,” according to Dyché’s white paper. There are a number of errors that can defeat the establishment of a successful data governance structure. One of the key problems is a tendency to see data governance as a strictly technical function that applied software and consulting dollars can solve. In reality, business unit directors and managers (likely data owners and stewards) must be engaged at all times. Another problem is information services’ detachment from the organization’s objectives—its failure to attach governance to every project so that misguided ones can be identified early to avoid consuming additional organizational resources. On the plus side, good governance can propel other projects forward and create data alignments so synergy can occur and work can be deduplicated. Additional problems take the guise of data governance members starting to intrude into the actual technical implementation (eg, how a data element will be defined and implemented and in which source system it will be contained). It takes consistent membership and dedication of senior leaders to keep data governance consistent and on track. Painful as it may be, these committees, once formed, need to remain in place to monitor data quality and enforce accountability for failure to maintain agreed-upon standards. Members need to be able to withstand political pressure from others who want to do it the way it’s always been done. As William McKnight says in “Five Top Mistakes in Information Management Governance,” “No committee can foresee the future perfectly or knows it all.” His guidance suggests that organizations must proceed forward and make decisions even if some of them turn out to be incorrect. — Sandra Nunn, MA, RHIA, CHP, is a contributing editor at For The Record and the enterprise records manager at Presbyterian Healthcare Services in Albuquerque, N.M.